I don’t know what I was expecting of Iceland, but I certainly wasn’t prepared to step off the plane onto another planet. Iceland’s landscape is completely foreign, like it could be a film set: vast fields of black volcanic silt as far as the eye can see and not a tree in sight. Everything seemed odd — rather than grass, the rolling hills were covered in thick green moss, and rather than mountains, we drove past great crevasses, cracked open hundreds of feet deep in some volcanic catastrophe centuries ago. Iceland is a land of contrasts: behemoth glaciers sliding slowly past actively smoking volcanoes. The tranquility of the aurora borealis was interrupted by the roar of the deadly waves crashing against the black cliffs of the southern coast. Even the island’s geological record reflects this: Iceland is slowly being pulled apart by the two tectonic plates it sits on. 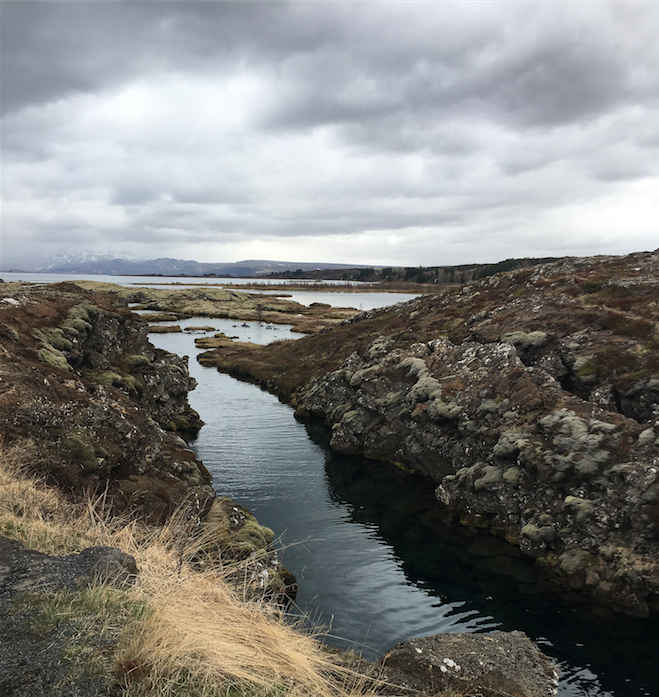 In Thingvellir National Park (Iceland’s single mainland UNESCO World Heritage Site and the first stop on our tour), one can see the edges of the tectonic plates and stand in the strange “no-man’s land” between them. Thingvellir was also a site of cultural significance long before we understood its geological singularity. The lowlands between the two plates were the location of Iceland’s first Althing — the meeting of the early Icelandic Parliament — in the year 930 CE. Nowadays, it’s a grassy marsh where tourists can take pictures of the tectonic rift, or even go scuba-diving in the frigid underwater caves. Thingvellir is also the first of many sites along Iceland’s famous “Golden Circle” road from Reykjavik to the geysers of Haukadalur. Though the first geyser, Geysir (whose name, as you can guess, inspired the term in English), has lain dormant for several years, the smaller geyser, Strokkur, erupts every few minutes, spewing boiling water 20 feet into the air. 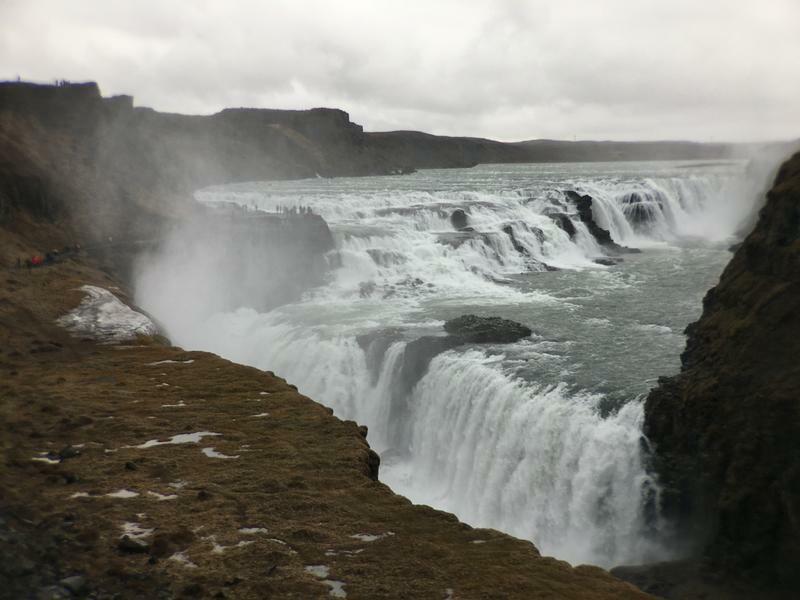 After seeing the geysers, most tourists continue on to the final Golden Circle site: Gullfoss, the Golden Falls. This massive waterfall is one of approximately 10,000 on the island and by far one of the biggest and most powerful. Every time I lifted my phone to take a picture, I had to pray that it might turn out well, as my phone screen, lens and sunglasses were completely soaked. Since this foss (as the locals say) goes around two corners before its final drop, there is nowhere to stand where one won’t be drenched within seconds. There is a myriad of waterfalls, craters, geysers and other odd natural phenomena to see from the road — and that’s just within this little circle west of Reykjavik. As we ventured eastward, the sights only got stranger. Every corner you take reveals another foss or three, or the glowing blue toe of a glacier, or the ominous cone of an active volcano. The landscape seemed to switch between lush farmlands, a blackened volcanic wasteland and finally an arctic tundra dotted with seemingly random boulders — the vestiges of an advancing glacier several millennia ago. Much of our time in Iceland was spent like this, listening to Led Zeppelin and staring awestruck out of the windows at the natural wonders so casually lined up along the highway. After days of waterfalls and volcanoes, we came to the last major natural site of our trip: Jökulsárlón lagoon. The lake itself is entirely opaque, a milky shade of blue caused by glacial silt. Small boat tours of the lake are available — but the boats aren’t the only things in the water. Dozens of massive icebergs split off the glacier every week and drift across the pale water like ghostly ships on their way out to sea. Many of the larger icebergs tower 20 or 30 feet above the small zodiacs that sail the lake. They are known to flip over without warning, creating waves that could easily capsize the small crafts into the freezing water. 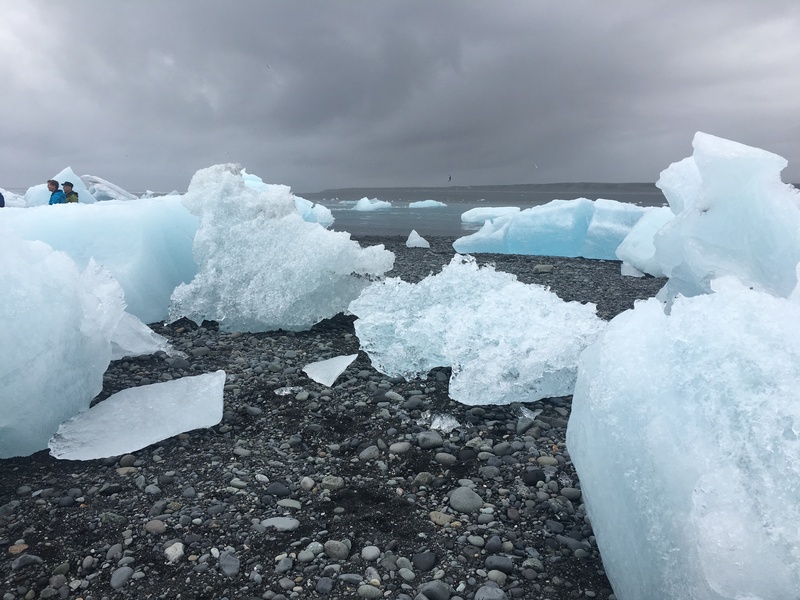 On the black, volcanic, sandy beaches nearby, chunks of ice taller than me were waiting to be swept out to sea by the rising tide. Standing on the beach, I could see everything: the lagoon, with its massive glacial source rising out of the hills behind it. I knew that just beyond the northern horizon was a volcano, and just east would be yet another waterfall. It shouldn’t have been beautiful — everything was black, beige or greyish-blue, the wind was howling and the waves were crashing — but its harshness only made it more extraordinary. The contrast between the bleak, unforgiving landscape and the quaint simplicity of the fishing villages that cling to Iceland’s southern coast with an admirable stubbornness was startling. Before I went, I’d heard of the kindness of Icelandic people, but even I underestimated how warm and welcoming this frozen island would be. As we drove along the mostly rural southern coast, I noticed that most of the road signs weren’t pointing the way to cities or towns — they bore the names of people’s houses and farms. Everyone’s house had an official sign on the highway! I was astounded at how close-knit the communities were. I often wondered how Iceland became the hub for hip, trendy tourism that it is today. Why did this tiny island on the edge of the world become the newest thing? It doesn’t have the classical architecture of mainland Europe, any sunny beaches or any nightlife to speak of. It’s all volcanoes and glaciers and waterfalls — so many waterfalls. After visiting it for myself, I think I finally understand: Iceland gives us the rare opportunity to bask in the full, unedited glory of nature. It is one of the few places on earth where we are forced to accept that we do not have control of our environment — it controls us. Iceland’s stark natural splendour made me feel incredibly small, and it was the best feeling in the world.